Vantage Career Center Board of Education members heard several updates during an otherwise brief meeting on Thursday. During his report to the board, High School Director Tony Unverferth said more than 700 area sophomores visited the school on Wednesday (see story below). 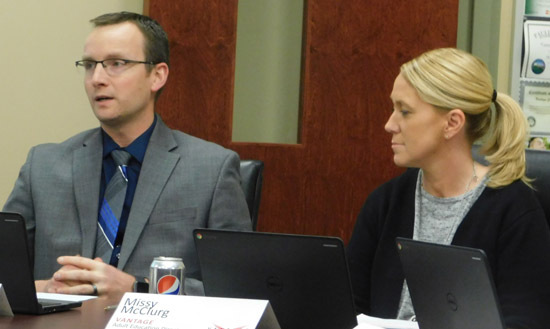 Unverferth also told the board that a “mock interview day” is scheduled for February 21, with nearly 30 local businesses coming to interview seniors, and he said the 2019-2020 school calendar will be presented for approval at the March meeting. Ohio Technical Center Director Missy McClurg told the board that orientation for Vantage’s firefighting class is scheduled for next Wednesday. A total of 10 students are enrolled in the initial class, with two more on a waiting list and eight signed up for the fall class. McClurg also said officials are working on a virtual reality tour for all Vantage programs, which could be ready for the February 25 open house. Treasurer Laura Peters and Superintendent Rick Turner said a recent meeting with top Ohio lawmakers was a success. Community Relations Coordinator Miriam Owens said Vantage recently held its annual “Step Into Your Future” event, aimed at seventh and eighth grade girls. Owens also previewed the upcoming Vantage Career Center Open House and Taste of Vantage, scheduled for 5 until 7:30 p.m. on Monday, February 25. “It’s mainly geared at sophomores who want to apply to Vantage, however, it’s not just for sophomores, it’s also for seniors who are graduating and want to continue their education here in our OTC program,” Owens said. “It’s also for adults who want to advance their skillset in any of our OTC programs. High school and OTC Adult Education labs will be open for visits and special demonstrations will be available along with food from several local vendors. In other business, board members approved a field trip for Auto Body and Auto Technology students to attend the Autorama Car Show in Detroit on March 1; a field trip for Construction Equipment Technology and Electricity students to Construction World Expo in Fort Wayne on February 20; an overnight trip to Columbus for State BPA competition on March 19 and 20, and an overnight trip for Culinary Arts FCCLA regional contestants in Dayton February 15 and 16. Board members also accepted the donation of over $3,000 worth of various cylinders and forklift parts from CROWN Equipment in Celina. The next meeting of the Vantage Career Center Board of Education will be held at 7 p.m. Thursday, March 7, in the district conference room.